The Alford Corn Exchange is the very heart of the town and the place-to-be for public and private events. 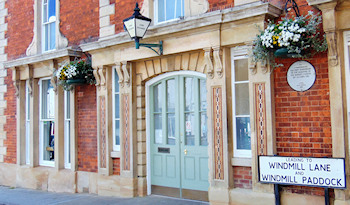 Located on the central Market Place the building has been welcoming visitors and the town's citizens for generations. Built in Italianate style in 1856, the Grade II features a beautiful central lantern, a great sprung dance floor and stage. We offer regular weekly events such as Zumba, Slimming World, Sunday Tea Dances, Short Mat Bowls, Ballroom Dancing as well as Craft Markets, Antique Fairs, Coffee Morning Fund raisers and Craft Fairs. We also organise numerous Theatre Shows, Film Nights, Race Nights, Dance and Music Performances. For our current programme, please see the 'What's On' page. The Corn Exchange is also available to hire for: birthday and anniversary parties, wedding receptions, funeral teas, corporate & fundraising events or functions, auctions, sports & club activities, meetings, conferences, recreational courses & classes. If you are organising an event, please contact us and we will help you to make a success out of your plans.